NCRS racing video re-released on DVD with an additional hour of never-before-seen footage! Interest in Corvette racing, both past and present, has never been greater. Why not, with the Corvette Racing Team winning 63 of the 90 races entered through the 2007 season? Those 63 wins include an amazing 45 1-2 finishes! Two long-time NCRS members (Jim Gessner and Jan Hyde) started a formal registry for all Corvette racecars. If you have an interest in Corvette racing, I'd highly encourage you to visit their website at www.registryofcorvetteracecars.com. With his knowledge of early Corvette racing history, its no surprise that Jim served as producer and narrator for the original NCRS VHS videos from the early 1990's. What better time to re-release and update the classic NCRS racing video California Screamin? 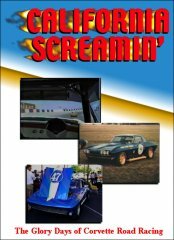 Part one is titled The Early Years of Corvette Road Racing, and features lots of period racing footage and photos of these famous cars at speed on California tracks. The contributors to the project read like a "Who's Who" of famous Corvette drivers! The 1991 NCRS National Convention in Anaheim, California brought out many Corvette racecars and we took advantage of it to film the sequel. Part two is titled The Road to Restoration and features an hour of interviews with the owners and restorers of these famous racing Corvettes. It features an hour of interviews with owners and restorers of these famous racing Corvettes.